Baghdad: The last convoy of US soldiers pulled out of Iraq on Sunday, ending nearly nine years of war that cost almost 4,500 American and tens of thousands of Iraqi lives and left a country still grappling with political uncertainty. The final column of around 100 mostly US military MRAP armoured vehicles carrying 500 US troops trundled across the southern Iraq desert through the night along an empty highway and across the Kuwaiti border. Honking their horns, the last batch of around 25 American military trucks and tractor trailers carrying Bradley fighting vehicles crossed the border early on Sunday, their crews waving at fellow troops along the route. “I just can’t wait to call my wife and kids and let them know I am safe," Rodolfo Ruiz said as the border came into sight. Soon afterwards, he told his men the mission was over, “Hey guys, you made it." For President Barack Obama, the military pullout is the fulfilment of an election promise to bring troops home from a conflict inherited from his predecessor, the most unpopular war since Vietnam and one that tainted America’s standing worldwide. For Iraqis, the US departure brings a sense of sovereignty but feeds nagging fears their country may slide once again into the kind of sectarian violence that killed thousands of people at its peak in 2006-2007. Prime minister Nuri al-Maliki’s Shi’ite-led government still struggles with a delicate power-sharing arrangement between Shi’ite, Kurdish and Sunni parties, leaving Iraq vulnerable to meddling by Sunni Arab nations and Shi’ite Iran. The intensity of violence and suicide bombings has subsided. But a stubborn Sunni Islamist insurgency and rival Shi’ite militias remain a threat, carrying out almost daily attacks, often on Iraqi government and security officials. Iraq says its forces can contain the violence but they lack capabilities in areas such as air defence and intelligence gathering. A deal for several thousand US troops to stay on as trainers fell apart over the sensitive issue of legal immunity. For many Iraqis security remains a worry - but no more than jobs and getting access to power in a country whose national grid provides only a few hours of electricity a day despite massive oil potential in the OPEC country. “We don’t think about America... We think about electricity, jobs, our oil, our daily problems," said Abbas Jaber, a government employee in Baghdad. “They left chaos." After Obama announced in October that troops would come home by the end of the year as scheduled, the number of US military bases was whittled down quickly as hundreds of troops and trucks carrying equipment headed south to the Kuwaiti border. 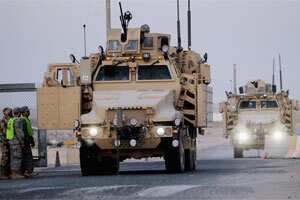 US forces, which had ended combat missions in 2010, paid $100,000 a month to tribal sheikhs to secure stretches of the highways leading south to reduce the risk of roadside bombings and attacks on the last convoys. At the height of the war, more than 170,000 US troops were in Iraq at more than 500 bases. By Saturday, there were fewer than 3,000 troops, and one base. At COB Adder, as dusk fell before the departure of the last convoy, one group of soldiers slapped barbecue sauce on slabs of ribs brought in from Kuwait and laid them on grills alongside hotdogs and sausages. The last troops flicked on the lights studding their MRAP vehicles and stacked flak jackets and helmets in neat piles, ready for the final departure for Kuwait and then home. “A good chunk of me is happy to leave. I spent 31 months in this country," said Sgt. Steven Schirmer, 25, after three tours of Iraq since 2007. “It almost seems I can have a life now, though I know I am probably going to Afghanistan in 2013. Once these wars end I wonder what I will end up doing." US and foreign companies are already helping Iraq develop the vast potential of the world’s fourth-largest oil reserves, but its economy needs investment in all sectors, from hospitals to infrastructure. Iran and Turkey, major investors in Iraq, will be watching with Gulf nations to see how it handles its sectarian and ethnic tensions, as the crisis in neighbouring Syria threatens to spill over its borders. The fall of Saddam allowed the long-suppressed Shi’ite majority to rise to power. The Shi’ite-led government has drawn the country closer to neighbouring Iran and Syria’s Bashar al-Assad, who is struggling to put down a nine-month uprising. Iraq’s Sunni minority are chafing under what they see as the increasingly authoritarian control of Maliki’s Shi’ite coalition. Some local leaders are already pushing mainly Sunni provinces to demand more autonomy from Baghdad. The main Sunni political bloc Iraqiya said on Saturday that it was temporarily suspending its participation in the parliament to protest against what it said was Maliki’s unwillingness to deliver on power-sharing. A dispute between the semi-autonomous Kurdish region and Maliki’s central government over oil and territory is also brewing, and is a potential flashpoint after the buffer of the American military presence is gone. “There is little to suggest that Iraq’s government will manage -- or be willing to -- get itself out of the current stalemate," said Gala Riani, an analyst at IHS Global Insight. “The perennial divisive issues that have become part of the fabric of Iraqi politics, such as divisions with Kurdistan and Sunni suspicions of the government, are also likely to persist."